You did it! 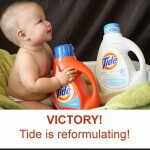 Procter & Gamble has just agreed to reformulate Tide and Tide Free & Gentle to drastically reduce the levels of 1,4-dioxane! Read our press release to get the details. Congratulations to all of you who raised your voice, and special thanks to Lori Alper of Groovy Green Livin, who started the Change.org petition that received 78,000 signatures. Watch this short video to see how the power of women moved the biggest consumer product company on the planet to make this change in just one short year. Procter & Gamble has agreed in a California court to reduce levels of 1,4 dioxane in Tide and Tide Free & Gentle to below 25 ppm. It will do so through modifications to its manufacturing protocol for the surfactants used in laundry detergent, thereby preventing the creation of the 1,4 dioxane contamination. Procter & Gamble has a target of September 30, 2013 in which to complete these changes. 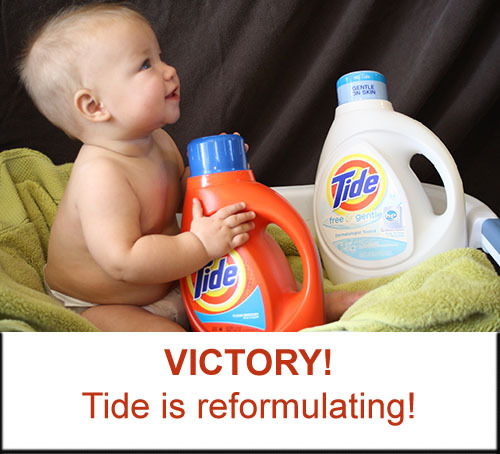 The reduction in 1,4 dioxane will also be implemented for several other laundry detergents made by Procter & Gamble including: Tide HE Original, Gain HE Original ,Tide for Coldwater Fresh Scent, Cheer HE Fresh Scent, Dreft HE 2X, Era Active Stainfighter HE 2X and Ivory Snow Gentle Care 2X. Read more.